We invite you to visit Endris Jewelers where you can view a large inventory of items in our comfortable store. Located in downtown New Albany, we pride ourselves on our friendly atmosphere. Come on in -- we¹ll greet you at the door and offer to show you our wide selection. We know that your jewelry is important to you, and when you have to have that jewelry repaired or appraised, handing it over the counter can be difficult. At Endris Jewelers we take care of your repairs conscientiously. We do what needs to be done so that you can have years of enjoyment from your special items. We, also, have a certified gemologist on staff for all your appraisal needs. All of our repair work and appraisals are done HERE, in our store. 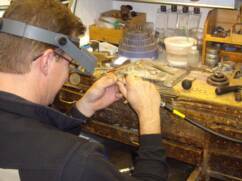 We never send your jewelry out for repairs, so you can be reassured that it is in safe hands. At Endris Jewelers there is no such thing as a "standard" custom design. Each design that we create for you is unique and part of a creative process that includes YOU from the very beginning. At the beginning, we talk -- about your ideas, about the stones you may want in the piece, about the transformation you would like to see. We guide you along the way -- using our expertise to help you create a piece that will reflect your special style. From the simple to the elaborate, we insure the proportions are perfect for your new piece of jewelry. At the end of the process, you will have a new design -- created for you and treasured forever.